Gasp! The Siberian Clubhouse was torn down and fed to an evil hungry buzzard. Readers were outraged. Amici, in particular said, "We thought the clubhouse was so cool. Did Kat and Steve just not use it enough??". What will happen? Why was the Clubhouse destroyed? Last month we showed you how we had been trying to dig under the clubhouse. The fact that we were intently trying to get under the clubhouse, combined with the fact that Mom found three dead baby mice in the yard, made Mom think that there was a mice nest under the clubhouse. Since the only time we ever went into the clubhouse was to chase Wilbur into a corner, Dad decided the clubhouse had to go. What's interesting is that when Dad finished tearing out the entire clubhouse, guess what he found under it? A really cool Scooby Doo ball! Not a single mouse. So now Mom and Dad have no idea where the baby mice are coming from, but Mom says as long as they are just in the yard, she guesses she won't worry too much about it. Now about that Scooby Doo ball. It's the most fun ever! It doesn't even squeak, but I love it to pieces. 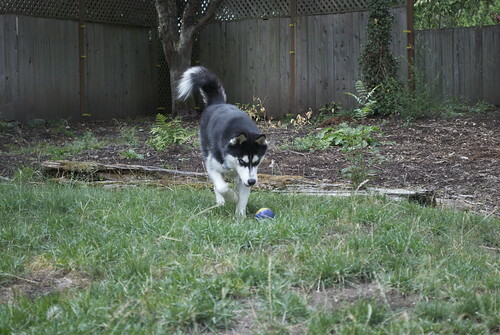 Mom and I played a little Scooby Ball in the yard. It's just so fun to pounce on! So there you have it, the story of the Siberian Clubhouse. To be honest, I haven't missed it. 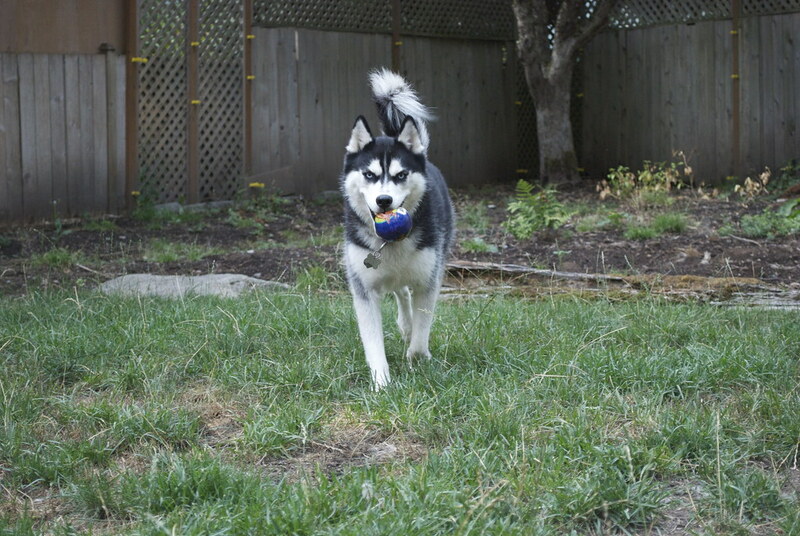 Now I have more room to get up some really fast zoomies along the back fence and I have a new Scooby Doo ball. PS. Speaking of Amici, he's going to get his new human puppy today or tomorrow, so we want to wish him and his family the best! We're sure Amici will make the best big brother any human's ever had. Aug 24 I'm the King of the World!